The Vision T40 treadmill is a non-folding machine from Johnson Fitness, one of the largest home fitness manufacturers in the industry. It offers many great exclusive features that justify the relatively high price tag. You can choose from the Classic, Elegant+ and Touch+ consoles, each offering different capabilities and functioning. The Classic is an extra large LED display with the basic workout feedback of speed, incline, calories, pace and heart rate and 5 workout programs. The Elegant+ is a 10" high-def touchscreen with ViaFit and additional feedback and 15workout programs. The Touch+ is a 15.6" high-def touchscreen with 19 programs. Get the T40 Treadmill On Sale Now at the Vision Fitness Store! 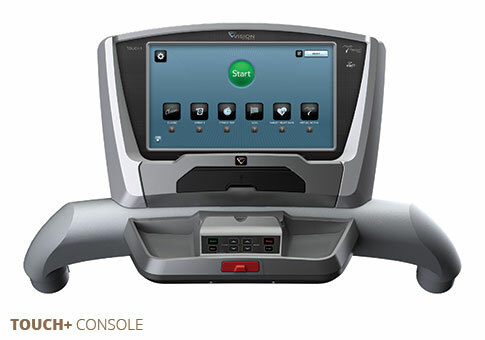 The Vision T40 is a solid treadmill, and critics seem to like the fact that you can pick the console that fits your needs. If you can afford the extra few hundred the Elegant+ and Touch+ consoles do give you a better display, more workout metrics and programs, ViaFit to track your workouts as well as a free Polar heart rate monitor. So they are worth it for that additional capability. Also not available on the Classic Console is a new feature called Sprint 8, which is a speed and elevation interval program that has been proven to boost your energy and reduce body fat. You enter your age and your weight and the machine does the rest for you. Although it is only 8 minutes long, it's an incredible program and reviews have been very positive on it. You can connect the machine to your home TV with something called Passport, which comes with two destinations: the American Southwest and Northern Italy. So you can watch those two locations unfold right in front of you as the machine syncs your speed and intensity to match the feel. (Note a separate player is required for this function) With the Elegant+ and Touch+, you don't need a separate Passport module as they are both Virtual Active Integrated machines. Some other great features on the Vision T40 treadmill include thewhisper quiet Johnson Drive motor, the Infinity Deck which is maintenance-free as well as a water bottle holder, reading rack and an accessories tray. 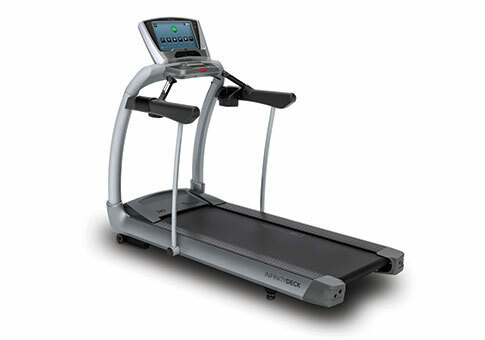 The T40 is a great, durable, well-built treadmill and certainly worth considering if you are in the $2,000+ range. It is non-folding, so if you are interested in a folding model check out the TF40, which is basically the same machine. As we mentioned, the basic console is sufficient but you get a lot more with the other two. Take a look at the Elegant and the Touch, as each offers something a little different. Vision makes very high quality treadmills, and they are built to be maintenance free and last for years and years. They have a very good reputation and you won't be disappointed with your purchase. Most popular Vision Fitness treadmills are on sale right now!